Aerial photo of Ashington Colliery and illustration of ABTRA plans. As can be seen from the image below, the Ashington Colliery system was once highly extensive, with lines radiating outward in many directions. 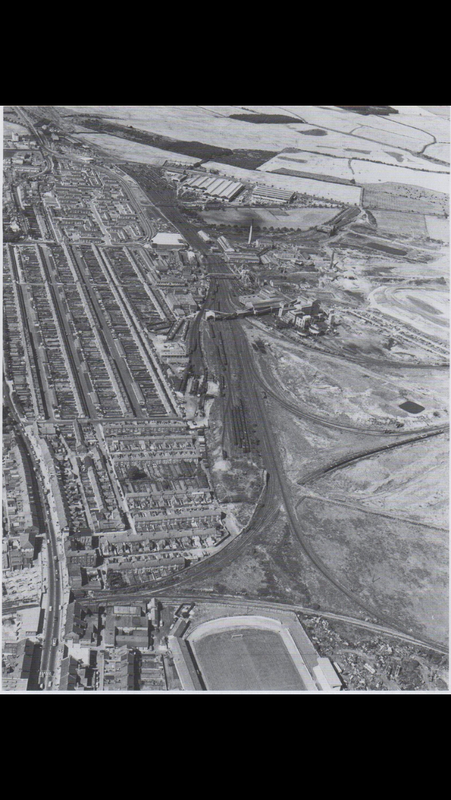 To give sense of location, the structure in bottom centre is Portland Park, now the ASDA store in Ashington, with the camera pointing approximately westwards. In bottom of the picture, a curved triangle exists, the point leading off to the left is southward towards Bedlington and Newcastle, running off to the very bottom right corner is the line to Lynemouth, and finally Butterwell disappearing about 1/3 off the bottom right corner. The final side runs from Ashington Colliery towards Lynemouth. The long term intention of ABTRA would be to rebuild this final side, but do so by connecting Butterwell to Lynemouth, so the top end of this track would curve to the right (northwards) if viewed from this angle.